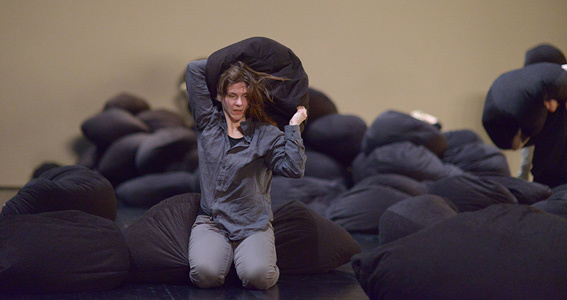 At the interface between visual arts, dance and performance, Form and Mass examines the relation between energy and matter, between material and movement, and the subsequent emergence of form. The material serves as an amplifier towards visibility: it elongates the body into its surrounding space. This transitional object, the last inner layer and at the same time the first outer layer, becomes the bodies’ connection to the outer world. It uncovers existing movement patterns that are based on archaic energetic principles and proposes them as the object to be looked at, whilst the person generating the movement stays the subject of the event. In front of our eyes new beings and paradoxical landscapes emerge,...lansdscapes in which phantasy figures arise from the stories of Lewis Carrol till they vanish again....fascinated by the relationship between form and content (filling), I have named the solo Form and Mass. After the landscape painting of Der Bau - Gruppe12x60, that just evoked enthusiastic reactions at Uferstudios, the solo work dedicates itself to being a portrait, embodied, realized and transformed by Sonja Pregrad.